This tour takes you to the heart of the Western Highlands. Enjoy Scotland's beautiful lochs, glens and mountains. Enjoy some of Scotland’s most beautiful lochs, glens and mountains as we travel through the Loch Lomond and Trossachs National Park to the delightful coastal town of Oban, in the heart of the Western Highlands. From Glasgow, Scotland's largest city we make our way along the "bonnie, bonnie" banks of Loch Lomond to Rob Roy Country and the Highland village of Tyndrum. 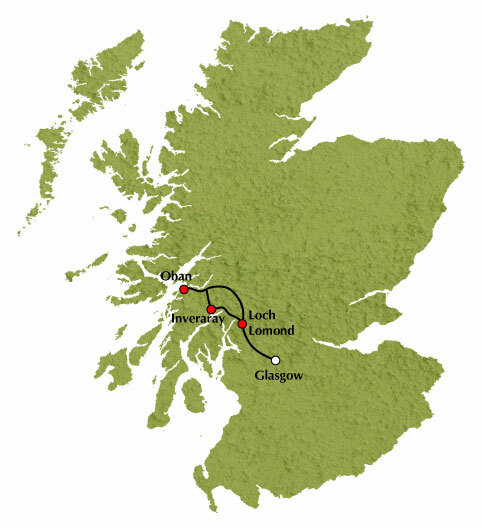 We carry on through Glen Lochy to romantic Kilchurn Castle at the head of Loch Awe. Loch Awe provided natural protection for many years for the Campbells of Inveraray against their enemies from the north. Our next stop is Oban, a bustling fishing port on the Firth of Lorn, where you’ll have time to explore the town and appreciate the views over to the islandof Kerrera and the Inner Hebrides. The "new” town of Inveraray, at the head of Loch Fyne, was built by the third Duke of Argyll between 1746 and 1780. The town retains much of its 18th-century charm, in the shadow of the duke’s castle. The "Rest and be Thankful” mountain pass leads us down to the original road built in the 18th century by General Wade as we make for the magnificent Argyll Forest Park. We return to the gentle shores of Loch Lomond once more from where it's only a short drive to Glasgow and the end of our tour. Tour Highlights: Loch Lomond, Luss, Crianlarich, Tyndrum, Glen Lochy, Dalmally, Loch Awe, The Falls of Lora, Oban, Kilchurn Castle, Inveraray, Rest and be Thankful, Argyll Forest Park, Glasgow.